Cozy Beehive: Who Really Buys Velomobiles? 28 Who Really Buys Velomobiles? I'll be just plain scared someone would run away with it. If there's a parking facility for it that I can trust, sure I'll lock it up there. Besides, it doesn't give you the mobility that bikes do in urban environments. Talk about hopping on and off trains, climbing stair etc with that thing. "The challenge companies like Go-One will face will be the one of building that culture up along with trying to sell some units." Is that the case with any bicycle company? All we need to do is convince the "rich guys on bikes" segment of the public that Velomobiles are cool. They already buy $7500 Serottas. So it is not a long leap to a $10,000 Velomobile. Velo : True. A friend of mine who's a lawyer tells me his client bought not one, but 3 of them. Rich guys on bikes, alright. Phil : The intent is for this to be a bicycle car. The things you mention are the tradeoffs for some other benefits. I don't get it. You'd have to participate in traffic and act like a slow vehicle so it seems to loose the biggest advantage of a bike for commuting and it lacks the comfort of a car. I don't see the appeal. Give it a small motorcycle engine and I think I could find a use for it but if I've got to pedal it I think I'd always prefer a more traditional bike that's lighter and more maneuverable. Clinton : I second your comment. Its not like it has a differential or anything. Question is how will it manage to stay upright during cornering, especially on busy roads. It is a 3 wheel tadpole trike. This bike is a great example of why things like this will never become a real answer to alternative power. The prices are so damn ridiculous that not many can afford them. If I could find one at a reasonable price I would buy it. Yeah yeah fancy this pricey that. But until you get the price down it is just a big expensive stupid toy. When someone can get a corolla for 3000 more, who is gonna﻿ buy this? No normal person. The Flevo Alleweder kit can be had for ~$3500. Not as pretty but comparable aerodynamically. Economies of scale keep the prices high. Also, until recently, *no* velomobiles were built in North America. So you had to deal with shipping something big and heavy from Europe, as well as hefty import tariffs. The GoOne came from Germany I believe, and while it was pretty, there are a lot more choices out there now. BlueVelo in Canada is building and selling some nice velos, and a major trike-builder, Greenspeed, is about to release the Glyde. Pricing is beginning to get more reasonable, and the total cost of ownership is much lower than an automobile. If sales could move from the hundreds per year to a few thousand per year, prices could get much more attractive. Thanks for the input Warren. There are many other options apart from the Go-One, isn't there? I think its when it comes to servicing these things that you'll find most of your cost/inconvenience. Would you be able to carry this into a bike shop for repair? What is your feeling? The one fellow I know who commutes on his has it serviced at his LBS. The mechanicals of most velos are no different than bikes, so any bike shop should be able to service it. I suppose it would depend on the the bike shop, but I expect any recumbent-friendly bike shop would prolly be very motivated to have the chance to see a velo in-person. I commute with a Go One in central OH. 25 mile RT. It extends my commuting season to year round. Only condition that stops me is snow and ice. It is an attention getter - lots of questions. While the mechanicals look odd they really are no different than a bike. I do my own work but the local LBS's are very interested when I stop for supplies. Fred : Thanks for the input. A little ironic that snow and ice would stop you from riding, I can definitely see how dangerous it can be when riding in a velomobile. What about rainy conditions. Do you feel comfortable riding then, inside your Go-One? Traction is the problem in snow and ice. Ironically the biggest problem on five miles of bike path on my route. Its not cleared like the roadways. Up to 3" of new snow is no problem but compacted snow and ice is. A velomobile is safe when driven in a vehicular manner as taught by LAW. It can be safer than a bike due to the WOW factor, better lights and turn signals. My lights are DOT approved. In addition, a velomobile has crash protection that a bike doesn't have. We've been riding velomobiles in Minneapolis for almost 7 years now. I test-rode the Go-one before we settled on the Cab-Bikes, which are more practical for commuting. The Cab-Bike can carry 8 bags of groceries, has good ventilation, and is great in rain. During a rash of local attacks on cyclists, my husband's Cab-Bike thwarted an assailant who leapt out at him in the dark -- and was startled to find a velomobile behind that headlight. 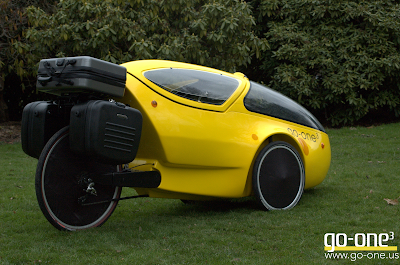 Cold weather and rain are no problem when you ride a velomobile, but snow can stop them. Except for the Aurora velomobile from British Columbia, most velomobiles have just one wheel in back, and it's hard to break three tracks through the snow with one-wheel drive. I've been using an unenclosed trike with two wheels in back, and just dressing warmly this winter. Hey thanks Mary and others for some great input. I personally would love to meet someone who rides a velomobile to hear of their experience with their machines. Its certainly a rare speciality group, and personally I haven't seen any in the area around where I live so far. The 2010 Left Coast Velomobile Gathering is scheduled on Memorial Day weekend at the Portland International Raceway in Portland, Oregon. Being planed now for July 2011 is the Roll Over America Tour. Roughly 21 European Velomobile riders will ship their velomobiles to Portland, Oregon and ride them to Washington DC. North American velomobile riders will be joining in for all or part of the ROAM Tour. There are nine velomobiles in Oregon now including mine. I have a WAW that was manufactured in Gent Belgium. I like the Glyde, Go-One Evolution & Aerorider. If I could afford one, I would own one. You could also use it for advertising your business or someone else's or maybe use it for parades, tours, fund raisers, etc. Concerns for me are that they are wider than a bicycle and many roads where I live do not have shoulders (I ride main roads a lot) and it is harder to see little cracks, holes and garbage on the roads than on a regular bicycle. If a person can get a tax credit for buying a hybrid automobile, why not a tax credit for a bicycle/velomobile? The body uses less gas than the hybrid! and you get good exercise. Less ware-&-tear on your car which saves money. Tripod is $7450.00 today! I just looked at their site you referenced. I am a physically disabled man . I have ridden trikes around for many yrs. ( over 20 plus yrs. ) and I am very much interested in a velomobile . I was just wondering if I could find one with a shorter wheelbase , but a closed in body ? Any reports and or suggestions would be greatly appreciated . Thomas K. Hawes Jr. , 75 Central St., Peabody , MA 01960 . Compare it to the Elio at $6800.00. Most velomobiles are way over priced. You can get a decent bicycle for under a grand and a trike for $3,000. Is it really necessary to spend $7000 to enclose a tricycle?